Eighty Colombian non-governmental organizations release a document, El Embrujo Autoritario ("The Authoritarian Curse") criticizing the performance of President Álvaro Uribe and his thirteen-month-old government. Uribe lashes out at Colombia's human rights groups in a speech before armed forces members gathered for the inauguration of new Air Force Chief Gen. Edgar Lésmez. 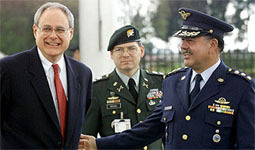 Lésmez replaced Gen. Fabio Velasco, who faced allegations of blocking human rights investigations and, by many accounts, was forced to resign in part by US pressure. Uribe calls human rights groups, among other things, "spokesmen for terrorism" and "politickers of terrorism." He challenges them to "take off their masks ... and drop this cowardice of hiding their ideas behind human rights." Uribe's speech distinguishes between serious human rights groups and "politickers," but fails to explain how he makes this distinction. While some of Uribe's advisors and supporters had faced criticism for making similar unsubstantiated and dangerous statements, Uribe himself had avoided using such language during his campaign and during his first year in office. In fact, his government's "Democratic Security" document, released in June 2003, emphasizes the need to "protect opposition political leaders and dissidents, thereby securing the democratic framework and possibilities for citizen participation." A July 2003 Defense Ministry directive instructs members of the security forces "to abstain from making unfounded declarations that could threaten the safety of union leaders or human rights defenders." French Supreme Court Magistrate Philippe Texier, on a visit to Colombia, warns that stigmatizing human rights organizations is "dangerous," as it "subjects people to danger of death." He adds that such methods have been used in Colombia's past and "it is unfortunate that they have appeared again." Responding to the NGOs' September 8 report, Armed Forces Chief Gen. Jorge Mora accuses groups of "using human rights for political purposes in order to survive. Their accusations don't worry us." Rep. Jim McGovern (D-Massachusetts) denounces Uribe's words in a speech on the floor of the U.S. House of Representatives. "We know that when high government and military officials start labeling civilian leaders and organizations as 'terrorists' or 'sympathizers,' their deaths soon follow." Como el Presidente no dio nombres, las ONG se sintieron aludidas y exigieron al Gobierno concretar las acusaciones para evitar que estas "se transformen en más amenazas y persecución". En una carta abierta enviada al presidente Álvaro Uribe, organizaciones internacionales expresan su "extrema preocupación acerca del significativo incremento de las detenciones arbitrarias de defensores de derechos humanos en Colombia"
Just as the furor over Uribe's remarks begins to die down, the president uses the same language during a visit to Chita, Boyacá, where a FARC bomb attached to a horse had killed several people the day before. "My commitment is with you, not with those who have lived by defending and giving consent to the terrorists, those people's honeymoon is over. My commitment is with you, it doesn't matter what the terrorists' defenders say." In Brussels, European Union foreign affairs spokesman Diego de Ojeda expressed "concern" for possible "tragic consequences" of the president's words. Defense Minister Marta Lucía Ramírez, on a visit to Washington, says the Colombian government will soon begin investigating about 1,300 NGOs throughout the country. "In the next few months the Vice President's office will be much more active in this area to know where these problems are. The idea is to avoid allowing people to take advantage of the NGO label to act as apologists for actions that nobody supports." The next day, Vice President Francisco Santos contradicts the defense minister's statement. "We're not going to examine these NGOs," he tells the Colombian daily El Tiempo. "The truth is, we have no plan to examine them at this moment. We have regular communication with them. We're talking to them. We want this fluid dialogue to continue." The vice president invites several NGO leaders to his home for dinner. His guests refuse the food, and participants describe the meeting as tense and unproductive. Great Britain's ambassador to Colombia, Tom Duggin, says that NGOs "misinterpreted" Uribe's remarks, adding that European governments' view of Colombia is improving because "some European NGOs are doing a bad job of presenting guerrilla propaganda against Colombia's governments." Press release from Colombian non-governmental organizations attending the seminar "Colombia insists on human rights"
An unnamed U.S. State Department source tells the Colombian daily El Tiempo that President Uribe's verbal attack on NGOs could make it harder to sell future military aid packages to a Congress that includes many skeptics. "This isn't helping us at all," the source says. NGO representatives hold a two-hour meeting in Bogotá with James LeMoyne, the UN Secretary-General's special representative for Colombia. According to the account of one group's director, Lemoyne expressed "his profound concern with the polarization that has followed the president's comments." ¿Es posible regular a las ONG? President Uribe writes a letter in response to an El Tiempo op-ed by analyst Eduardo Pizarro. Pizarro's piece called Uribe's words a "serious error," but also criticized the quality of human rights NGOs' work. Uribe responds, "Of course, if the tone of my words offends some sensibilities, they will be offered apologies for the tone; but in the defense of Colombians' security we will not have any weaknesses." Foreign Minister Carolina Barco acknowledges that Uribe's attack on NGOs may make diplomacy in Europe more difficult. "I have asked our ambassadors to explain to other governments the fairness of the president's words in order to avoid more confusion that could do more damage to the country." Le piden al Presidente que no trate a los defensores de derechos humanos y sus contradictores políticos e ideológicos "como sus enemigos". Carolina Barco dijo que el mayor impacto se dio en Europa, en donde "están relacionadas con los gobiernos y hay una muy alta sensibilidad"
Así lo afirmó en una carta que envió como respuesta a una columna del académico Eduardo Pizarro, titulada "En boca cerrada no entran moscas"
Los activistas de derechos humanos colombianos están en peligro de muerte después que el presidente Uribe declaró que están vinculados a "organizaciones terroristas". Nineteen members of the U.S. Congress sign a letter to Secretary of State Colin Powell, written by Rep. Jan Schakowsky (D-Illinois, pictured), asking him "to make a strong public statement dissociating the United States from President Uribe's remarks." Four U.S. Senate Democrats - Christopher Dodd (D-Connecticut), Patrick Leahy (D-Vermont), Russell Feingold (D-Wisconsin) and John Kerry (D-Massachusetts) - write a letter to Secretary of State Colin Powell asking that he "direct the United States Ambassador to Colombia to issue a public statement expressing concern with President Uribe's remarks." Sen. Joseph Biden, the ranking Democrat on the U.S. Senate Foreign Relations Committee, sends a letter to President Uribe. "I am deeply troubled about your comments, and their potential effect on the safety of human rights defenders in your country, and those working for international organizations who may travel to Colombia," the letter states. In a letter to Colombian human rights groups who had asked President Uribe for either an apology or an explanation of which groups he was talking about, the president's office refuses to do either. "The messages of the President of the Republic in public venues on September 8 and 11, 2003, are the expression of the political opinions of the Commander-in-Chief who, as head of state and head of government, is constitutionally authorized to do so. That is, to serve as an inspiration to Colombians or simply, to create a general public opinion. ... As this is part of the legitimate exercise of political power by the head of state and government and the constitutional symbol of national unity, there is no reason for any rectification." Amnesty International releases a statement prior to President Uribe's visit to Europe urging the EU to refrain from supporting policies that risk exacerbating Colombia's human rights crisis. Human Rights Watch releases a similar statement, asking the European Union to postpone a donors' conference planned for later this year until Colombia fulfills key human rights commitments. Meeting with European Parliament officials in Strasbourg, President Uribe singles out the Colectivo de Abogados "José Alvear Restrepo", a prominent Colombian human rights group: "If the gentlemen of the Colectivo de Abogados wish to be lawyers for the terrorists, they can exercise that right, but to do that they do not need to hide themselves behind human rights organizations." An "editorial" on the website of the Bloque Central Bolívar paramilitary group claims that Colombian NGOs and the FARC are conspiring with European groups to sabotage President Uribe's visit. The paramilitaries claim that anti-Uribe protests show "the hand of the guerrilla 'diplomacy' of the FARC, whose presence in some European countries is a matter of public knowledge." While hosting a "security council" in the Urabá region of Antioquia department in northern Colombia, Uribe issues a harsh warning to foreign human rights workers from Peace Brigades International (PBI) and the Fellowship of Reconciliation (FOR) who are in the region accompanying besieged communities. "I want to remind the foreigners in San José de Apartadó that in Colombia there is not, nor can there be, impunity for either Colombians or for foreigners," Uribe says. "If you come here, come here to help our communities, not to obstruct justice. I reiterate to the police: if these [foreign human rights observers] continue to obstruct justice, put them in prison. If they have to be deported, deport them." FARC members kill 34 coca growers in La Gabarra, in the conflictive Catatumbo region of Norte de Santander department. This is the largest massacre since President Alvaro Uribe took office. During a ceremony for the promotion of officers in the National Police, President Uribe criticizes NGOs, specifically Amnesty International, for failing to denounce the La Gabarra massacre within the 28 hours since the event took place. He accuses the humanitarian groups of condemning "state terrorism," but then remaining silent when "the terrorist act is committed by a terrorist organization with whom the respective NGO may have ideological agreement." Amnesty International responds, condemning the La Gabarra attack and President Uribe's statements. An unnamed high-ranking State Department spokesperson gives a declaration to Colombia's most-circulated newspaper, El Tiempo, distancing the United States from President Uribe's attack on Amnesty International. "We are not at all in agreement with those statements. It is our view that human rights NGOs that gain international respect make significant and important international contributions in Colombia and other countries." Thirteen U.S. NGOs issue a letter condemning the La Gabarra massacre and reiterating concerns about President Uribe's attacks on human rights defenders. Sixty members of the U.S. House of Representatives sign a letter to President Uribe expressing concern over his May 27 comments about human rights defenders in Urabá. In an interview with the Colombian newsweekly Cambio, U.S. Ambassador to Colombia William Wood criticizes President Uribe for his comments, saying "We do not agree with what the President said. The NGOs have done important work all over the world. But we also understand the occasional frustration of the Colombian government, and we do not always agree with what the NGOs say. However, I am convinced that the government's vision of what Colombia could be in the future is the same as that of the NGOs. I do not think that the President's comments help the interests of anyone."